Financial statement assertions are the set of information that the preparer of financial statements is providing to another party. 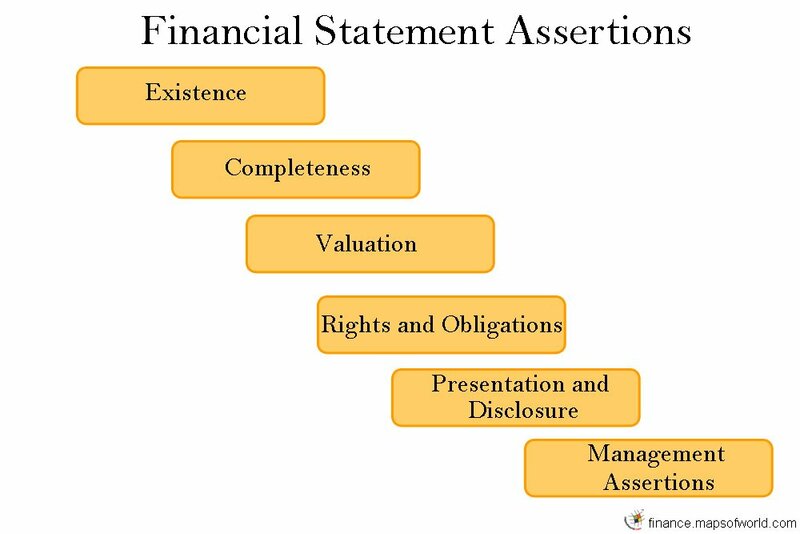 Financial statements represent a very complex and interrelated set of assertions. The financial statement assertions can be defined as the explanation by the management of a company regarding the measurement, presentation, recognition, as well as disclosure of the information which is contained in the financial statements. It is the implicit or explicit assertions that a company makes pertaining to the fundamental accuracy in its financial statements. There are basically five different financial statement assertions that the auditors collect to justify each and every item in the financial statement. The financial statement assertion on existence is made to check whether the specified assets and liabilities are present at the given date. It is also required to check that the transactions that are recorded took place at the specified date. In order to test these items of the financial statement assertions , it is not sufficient that only books are consulted which record the assets or the liabilities. There should be proof of the existence of the physical assets or liability. For checking existence help is also sought from outside. Checking completeness of a financial statement is to analyze whether all the transactions that are already given in the financial statement are correctly included. In order to abide by the completeness assertion, the auditors prove with the help of sufficient evidence that all the recorded transactions deserve to be included. This is further supported with an external document so as to provide evidence regarding the occurrence of the transaction. Valuation basically checks whether the different components of the financial statement have been included in the right proportion. The components are assets, liabilities, expense and revenue. The auditor does this with the help of GAAP. Know More : What is Business Valuation? This financial statement assertion is used to check whether the assets that are included in the financial statement are the rights and the liabilities are the obligations of the company. In order to ensure this, sometimes special purpose entities are created. This financial statement assertion is to ensure whether the items in the financial statements are classified in the right way. It is important to check that the account balance is calculated as well as disclosed properly. OCCURRENCE: The transactions actually took place. COMPLETENESS: All transactions that should have been recorded are recorded. ACCURACY: The transactions were recorded at the appropriate amounts. This is not an assertion in Voyager. AUTHORIZATION: All transactions were properly authorized. CUTOFF: The transactions have been recorded in the correct accounting period. CLASSIFICATION: The transactions have been recorded in the proper accounts. EXISTENCE: Assets, liabilities and equity balances exist. RIGHTS AND OBLIGATIONS: The entity holds or controls the rights to its assets and owes obligations to its liabilities. COMPLETENESS: All assets, liabilities and equity balances that should have been recorded have been recorded. VALUATION AND ALLOCATION: Assets, liabilities and equity balances are included in the financial statements at appropriate amounts and any resulting valuation or allocation adjustments are appropriately recorded. OCCURRENCE: The transactions have occurred. RIGHTS AND OBLIGATIONS: The transactions pertained to the entity. CLASSIFICATION AND UNDERSTANDABILITY: Financial statements are appropriately presented and described, and information in disclosures is clearly expressed. ACCURACY AND VALUATION: Financial and other information is disclosed fairly and at appropriate amounts.